Cook hotdogs with the Sun in minutes. 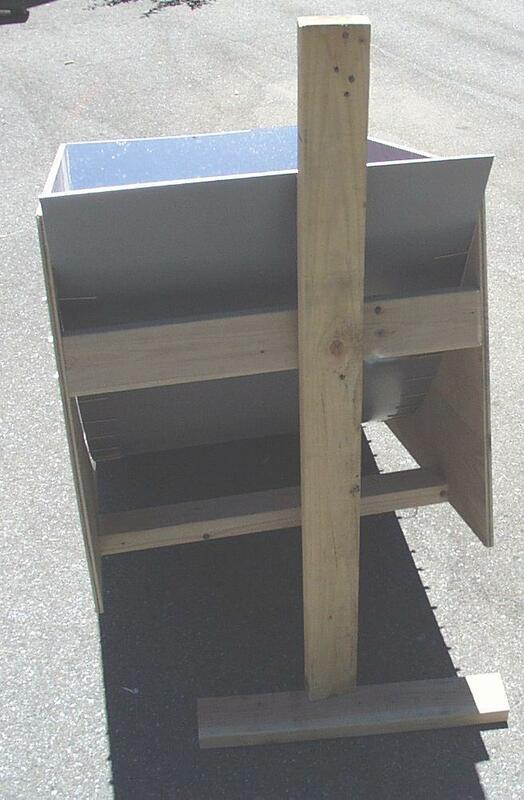 In this article we will show you how to make a powerful solar concentrator that can cook four or five hotdogs in minutes. 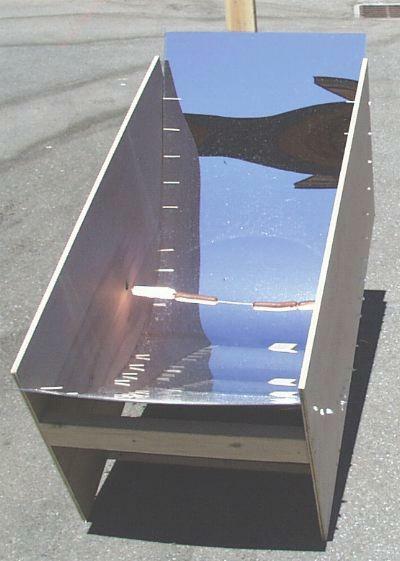 The Solar Hotdog Cooker is made out of a thin (1/8 inch thick) plastic mirror that can be found at plastic shops and glass stores (although it may have to be special ordered at some stores). The plastic is bent into the shape of a parabola, so that the sun's rays are collected over an eight square foot area, and focused in a thin line. The hotdogs are roasted on a spit placed at the focus, and turned every once in a while to prevent them from burning. Two pieces of plywood, 1/2 inch thick, 2 feet wide and 4 feet long. Two pieces of lumber, (2x4) 1 1/2 inch thick, 3 1/2 inch wide, and 8 feet long. 16 wood screws, 2 inches long. One stiff steel wire, 3 feet long. 92 small nails or wooden pegs, about an inch long. One plastic mirror, 1/8 inch thick, 2 feet wide, 6 feet long (although 5 1/2 feet long might work better). A drill and a bit that matches the diameter of the 92 small nails or pegs. A larger bit (over 1 inch wide) is needed for the food hole. 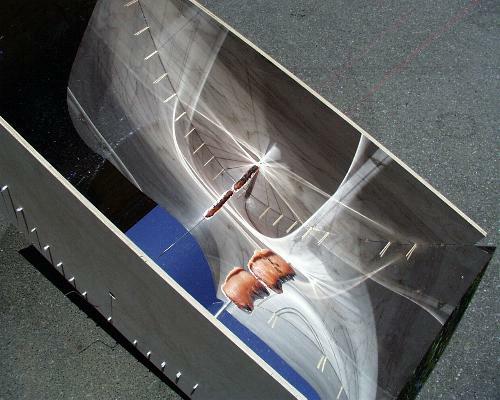 Place the two sheets of plywood together, one on top of the other. Using a tape measure and a carpenter's square, mark off where the holes will be drilled for the mirror supports (the 92 small nails or pegs). A second row of holes is drilled above these, separated by the thickness of the mirror. Next drill a set of holes above the first set, about a third of an inch above the first set of holes. The first set of holes will eventually have 23 of the small nails placed in each side, to hold the mirror up. The second row will also have 23 small nails pushed in, this time to hold the mirror in place from above. The exact spacing is not critical, but you don't want them too close together, or the top nails will hit the mirror instead of resting on top of the mirror. Next drill eight holes for the screws that will hold the 2x4 lumber in place. The holes are 3/4 inch from the edges of the plywood. On the left and right, a pair are drilled 15 inches from the bottom and 13 inches from the bottom. At the bottom, a pair are drilled 10 and 12 inches from the left, and the last pair is 36 and 38 inches from the left. The focus of the parabola is 9.14 inches from the bottom, and 24 inches from the left. Drill a hole that is the same diameter as the spit wire, or a little bit larger. This hole should go through both sheets of plywood. Just above one of the focus holes, drill a large hole in one plywood sheet, just touching the hole for the spit. This large hole will accomodate the food (hotdogs or kebabs), so it should be at least an inch in diameter, but three or four inches would be better. The spit with the food on it will be inserted into this hole, and the spit will then drop into the much smaller hole at the focus, to keep the spit in exactly the right place. Cut four pieces from the 2x4 lumber. Each piece should be exactly 2 feet long. Using the 2 inch long screws, screw the 2x4 pieces to one of the plywood sheets, centering each pair of screws in the end of each piece of 2x4. The result should look something like the legs of a small table. Attach the second plywood sheet to the other end of the 2x4 pieces. The photo above shows the back side of the cooker, where the 2x4 spreaders can be seen. Note also the remaining length of 2x4 is used as a support (more about that later). Next push 46 of the small nails into the bottom row of holes. The last step is to place a few screws in the remaining long piece of 2x4, leaving the head of the screws sticking an inch or two out of the wood. These will act as supports to hold the cooker so it is tilted toward the sun. The spit is formed from the 3 foot piece of wire. A coat hanger can be used, but wires that thin tend to sag in the middle when burdened by a few hotdogs. A thicker, stiffer wire is better. 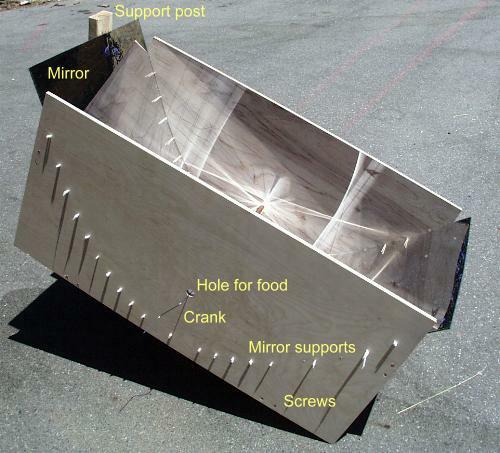 To make it easier to turn the food, a crank is formed by bending the wire at one end as shown in the labeled photo. Carefully poke the 3 foot wire spit through the hotdogs or kebabs. Try to center the food on the spit, so the food will rotate when you rotate the spit, instead of slipping to keep the heavy part down. Insert the spit through the food hole, and insert the far end of the wire into the small focus hole in the far plywood sheet. Rest the near end of the spit in the small focus hole at the bottom of the food hole. 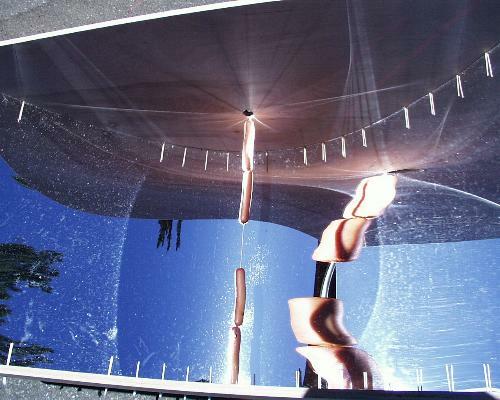 Align the solar cooker with the sun. Start with the cooker flat on the ground, then turn it until it is parallel with your shadow. The sun will just barely graze both of the plywood sheets when the cooker is aligned properly (this can be seen in most of the photos on this page). Next tip one end of the cooker up until the shadow of the spit falls directly on the center nail at the bottom of the parabola. This can be clearly seen in the labeled photo. Hold the remaining scrap of 2x4 up against the back side of the cooker, and mark where a screw should be placed to hold the cooker at the right elevation. Screw the screw into the 2x4, leaving an inch or two sticking out to hold the top 2x4 spreader. If you like, the screw can be placed a little higher up, and the cooker can be adjusted to the exact angle by tilting the support backwards. When the cooker is adjusted properly, the sun will be focused on the food, making bright lines across it (sunglasses are recommended at this phase). You can see the shadows of the nails on the walls of the cooker. These shadows should all cross at the focus, where the hotdogs are. 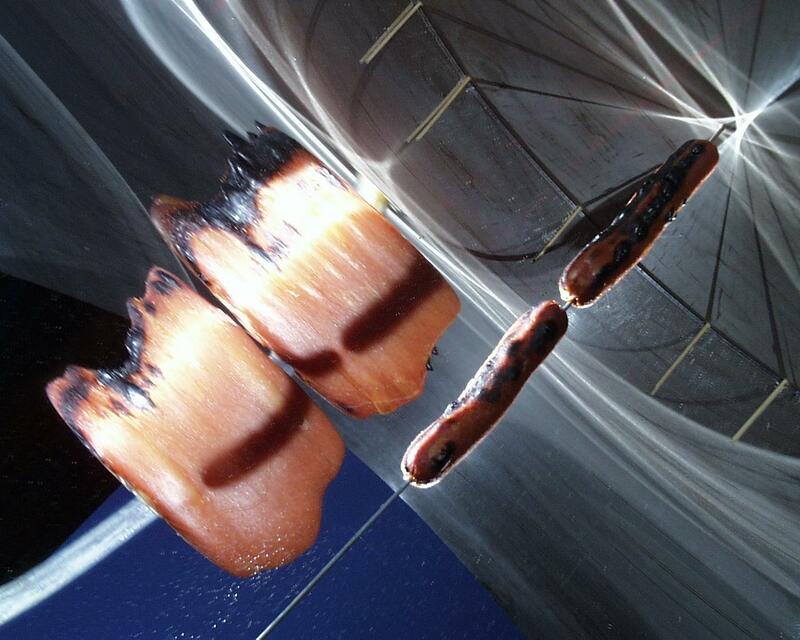 The hotdogs can be seen in the mirror, highly magnified. The shadow of the hotdogs can be seen being cast by the mirror onto the back side of the hotdogs in the photo above. In the photo below, the shadows of the nails can be clearly seen, crossing at the focus of the parabola. The hotdogs will start steaming in less than a minute. The spit should be turned every couple minutes to prevent black lines from being burned into the food (unless you like your hotdogs with black stripes). The hotdogs will be quite hot in about 10 minutes, or burned black all over in about 20 minutes. The shadows of the mirror supports seem to meet at the focus. The shadow of the hotdogs is projected onto the enlarged reflection of the hotdogs. The enlargement of the hotdogs only occurs in their width, not their length, because the mirror is only curved in one dimension. The poor hotdogs have been burned to a crisp (oops...). A parabola is a shape with some interesting properties that make it perfect for cooking hotdogs. The sun is bigger than the earth, and very far away. This means that the sunlight that hits the earth appears to be in parallel rays. If we had thousands of tiny mirrors, connected by hinges in a line, and we tilted each mirror so it would reflect these parallel rays onto one spot, the mirrors would line up in a parabola. Mathematically, a parabola is defined as a set of points that are the same distance from both a point (called the focus) and a straight line (called the directrix). I chose this formula so the parabola would be deeply curved, and would fit into the 2 foot by 4 foot plywood sheets. We want the focus to be close to the mirror, so that as the sun moves, the focus does not move very much. Having the focus close to the mirror is like having the fulcrum of a lever close to one end. The sun end of our lever can move a lot, while the hotdog end of our lever hardly moves at all. This means that we don't have to raise or lower the cooker very often as the sun moves. The +2 part of the equation says that the bottom of the parabola will be 2 inches from the bottom of the plywood. This gives us room for the 2x4 spreaders, and room to drill the bottom hole for the support nails. A square meter of the earth's surface gets about 1000 watts of power from sunlight. 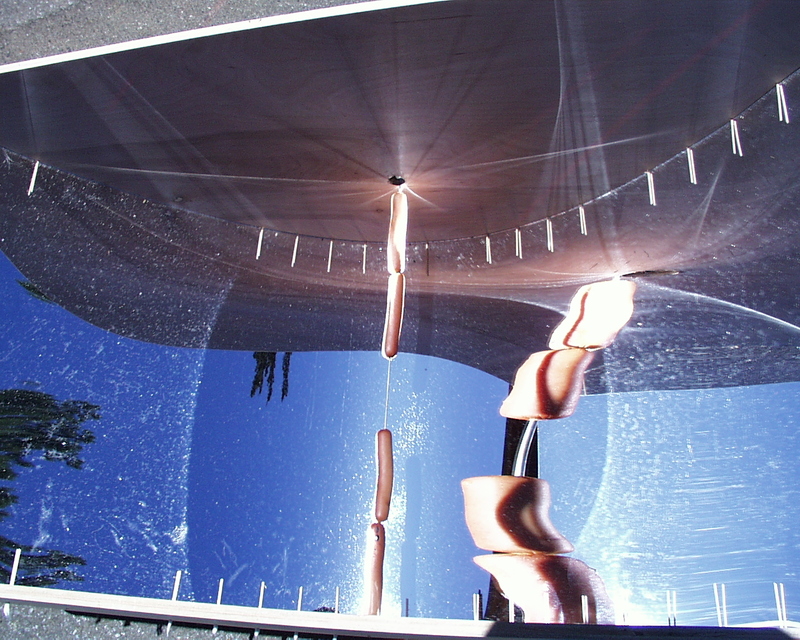 Our mirror intercepts about 8 square feet of sunlight, or about three quarters of a square meter. This means that our cooker is the rough equivalent of a 750 watt electric stove. Gonzo Gizmos by Simon Quellen Field.